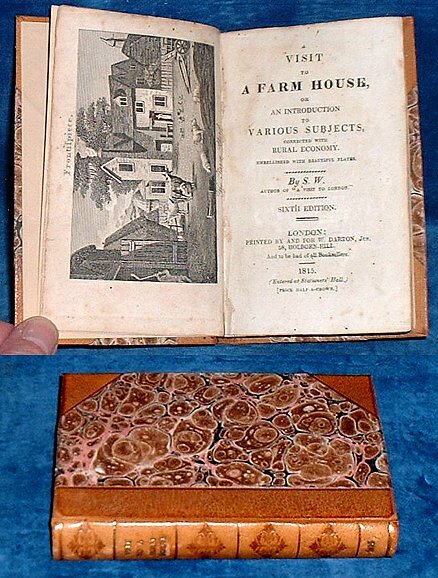 Title: A VISIT TO A FARM HOUSE, or an Introduction to Various Subjects, Connected with Rural Economy. Embellished with beautiful plates. By S.W. author of "A Visit to London." Sixth Edition. Description: London, W. Darton, Jun. 6th edition - actually the first Darton edition 1815 Engraved plates (10 as called for) dated 1815. . 137x85mm prettily bound in newer half gilt and blind tooled leather with marbled boards. New endpapers but original free endpaper retained. Frontis + titlepage + [iii]-iv +168pp +pp publisher's children's book list. Some edge-dusting and plates slightly darker but no foxing, a few signs of use, overall a very neat tight copy (Darton H853(1) Moon Tabart's Juv.Library 93(7)). *The first few editions were published by Tabart with fewer plates, successive editions added plates to a maximum of 10 all based on the Tabart plates although some may have been re-engraved or touched up as they became worn and the imprint changed to Darton when he acquired the title in 1815. All editions after 1806 and until at least 1820s require 10 plates whoever the publisher or assignees were.